Pick your own: one of the best ways to appreciate local fruit and produce. Stocking up on pick-your-own strawberries at Bohringer’s Fruit Farm near Middleburgh last week, I was struck by the variety of folks who beat me there early on a Sunday morning. There were locals making their annual pilgrimmages, many with small children or elderly parents in tow, chatting across the rows with city dwellers for whom it was a first-time novelty. Home canners like me were gathering jam ingredients to carry the taste of summer into January, while workers filled orders for retailers and restaurants. It was no small crowd; lines of cars stretched along the dirt road winding beneath Vroman’s Nose. Surveying the pickers, it occurred to me that there were lots of other things each of us could be doing on a beautiful Sunday morning in the mountains–activities involving hiking boots, or hammocks, or household chores. But the draw of fresh fruit grown by local farmers was enough to fill a field with people willing to get up early and spend time and money to bring home a portion of the harvest. 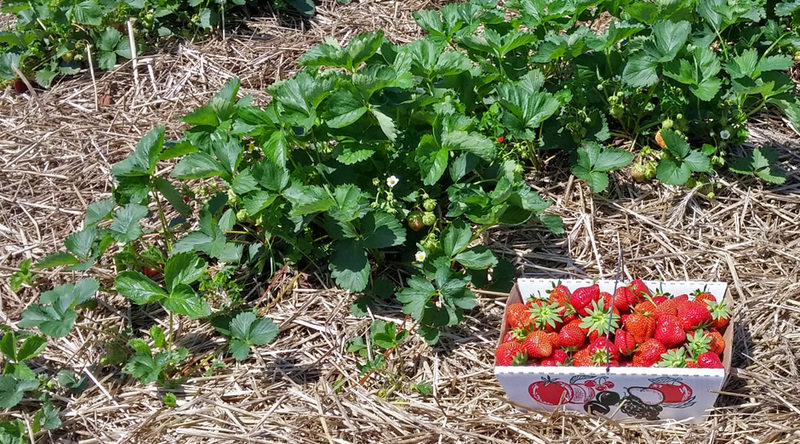 If mainstream media reports and anecdotal evidence are any indication, the popularity of pick-your-own strawberries this summer is just one example of a much larger trend. It’s the intersection of two trends, actually. The Catskills, in general, are having, as they say, a real moment. Judging by the number of must-see travel destination lists the region has landed on (the New York Times, the UK’s Guardian, Travel + Leisure and Fodors, just to name a few), not to mention a Manhattan nightlife guru espousing just last week that the Catskills are the new Montauk, we’re in the midst of a renaissance. Concurrently, a sea change is occurring in American culture, as more diners and grocery shoppers demand food that travels shorter destinations from its origins, undergoing less processing and collecting fewer pesticides, preservatives and modified genetic material along the way. With interest in eating high-quality local food (broadly defined by the U.S. Department of Agriculture as food raised or produced within 400 miles of the consumer) higher than at any time since local food was the default, the Catskills are perched on the threshold of perhaps the greatest food-marketing opportunity in North America. Three years after that essay was published, Royte’s prediction seems to be gathering steam. Last fall, Conde Nast Traveler declared “The Catskills are New York’s New Culinary Retreat.” Restaurant proprietors along Route 28 in Ulster and Delaware counties reported record crowds over Memorial Day, prompting talk of a lucrative summer tourist season. This spring brought the debuts of a spate of new eateries, from small ice cream and burger joints to full-blown fine dining operations. The seasonal wedding business is booming. Recent state legislation continues to create incentives for breweries, cideries and distilleries who base their libations on local ingredients. Catskill Eats will endeavor to chronicle the fast-growing and complex food scene in the five counties that make up the core of the Catskill Mountain region, with a strong emphasis on upstate agriculture, locally owned restaurants and small-batch artisan edibles. Please join us on Facebook, Twitter and Instagram for breaking news and more photos. Got a tip to offer? Drop us a line here.